We have already discussed some course design strategies and models that can help us move toward these seven principles as conceptualizing our courses, but let’s look at the primary components of a blended learning environment. These components can apply to a specific blended learning activity, a lesson or module, or an entire course design; however, we will primarily be working at the level of activities or modules here. Not all of these seven principles will apply to each guideline, but it is helpful to reflect on the principles and to try to integrate them as much as is appropriate for each component. In addition to fostering good student-student and student-instructor interaction and setting clear expectations for this, your students will want guidance on how they can succeed in your blended learning course in other areas. evaluate your course from a student perspective, and keep in mind that the online components will need explicitly outline your expectations, instructions, and objectives so that they students can see the pathway to learning as clearly as possible. This does not mean that they won’t meet challenges or frustrations with the blended environment or the integration of online components into your course, but being very thorough (more than you think you might need to be, even) and directive can help to mediate these challenges. Keep in mind that students often need to learn how to learn in a blended environment. For many, this many differ greatly from the delivery method of their other courses and they may not understand how this blended environment is a unique experience and pedagogy compared to a face-to-face only course. You may even meet some student resistance or opposition to this teaching style. For this reason, make sure to communicate your rationale and objectives to your students when appropriate and remind yourself that you are helping them to become self-directed and responsible learners in your blended learning environment via your instructions, tasks, and interaction with them. This Blended Learning Mix Map is part of the Blended Learning Toolkit. It is provided as an open educational resource under a Creative Commons Attribution-NonCommercial-ShareAlike 3.0 Unported License. Consider how the two environments interact and work to seamlessly engage students. There are phases of before, during, and after for each environment: before, during, and after the face-to-face session and before, during, and after the online session. The time between phases is a key area to make streamlined, clear, and impactful. The instructor can help connect these dots by establishing a clear learning objective and define the student responsibilities and instructions during each phase. For example, after a face-to-face session, be explicit about expectations for successfully participating in the online component that will follow. Now let’s look at a model that helps us think through the three phases. Consider the diagram at right and how the generic course elements listed within can blend a topic for your course. 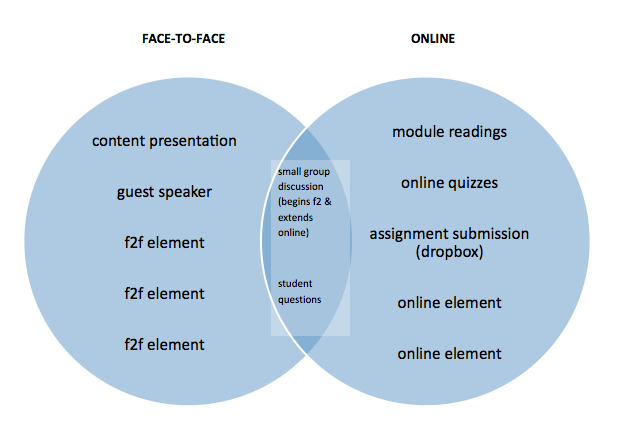 How might this diagram help you in organizing a blended learning activity or topic for your course? Is there a specific topic in your course that is already blended and would map to this model? Feel free to use your (or others) suggestions from the Activities Wiki to help you think about this. The diagram at right is available in template form by clicking the link below. Download the template and complete it for a lesson plan that you could make blended. Be sure to align it with a specific learning objective for your course. It is important to cultivate student-instructor and student-student relationships in any classroom environment but especially so in a blended learning environment so that your students know clearly what types and levels of interaction (with you and with each other) they should expect in each environment. You will be primarily responsible for fostering these interactions, setting the tone for these interactions, and encouraging your students to engage appropriately. Be clear about the formality, expectations, standards, and levels of engagement that accompany each; your students will want to know this up front, and it will be helpful for you to sketch it out for yourself as well. Time management is a key component of this facilitation. Make clear to your students how you will manage your time, when you will be interacting with them and how, and when you expect them to interact with each other and at what level. Clear expectations will ensure that the interactions in and between the face-to-face and online components are complimentary and as successful as possible. In a previous topic in this Teaching with Technology workshop, we explored online discussions as a tool to promote dialogue between students. We discussed The Four Roles of the Online Instructor as a way to help prepare an instructor for the various hats they’ll wear in managing an online classroom. As an initial step in thinking about how to best facilitate a blended classroom, review the chapter The Four Roles of an Online Instructor. The BlendKit offers a worksheet to help in thinking about blended learning interactions for a specific module. The worksheet helps in outline learning objectives, activities that will achieve the objectives, and the interactions students in which students will engage. You may well need to reevaluate traditional assessment methods in a blended environment to ensure that your assessments correspond to your learning objectives. Since all of the student learning is no longer taking place exclusively in the classroom, it would be appropriate to consider other assessment methods that align with the online environment where some of their learning is taking place. Consider discussions, self-checks or self-assessments, web quizzes, rubrics, in-class and/or online essays, “presentations” or discussion leading, and independent projects all as types of assessment for different purposes and to measure different levels of analysis and understanding. Using your learning objectives, ensure that each assessment serves a strategic purpose (both in content and in delivery method) and is useful to you and to the students; this may often mean that the traditional in-class exam or multiple choice on-paper quiz is not the most effective way of qualifying student progress. As with anything else, outline these assessments upfront in your syllabus and state clear expectations for how your students can be most successful with these. The last key consideration is making sure that all of your course components and your syllabus are clear, easy to location, organized, and practical for your students. Include any tutorials, support documents, or links to help for online activities and assignments in your course site, on your syllabus, and in any related online activities. Remember that integrating the online and face-to-face environments involves a bit of thoughtful planning where it’s helpful to put yourself in your students’ places to imagine what kinds of support will be valuable and provide guidance. Orient your students as much as possible to your course components and to your blended environment; you can do this via activities, course-specific tutorials, or even an email or “how to get started” instructions sent to your students before Day 1 of the course. Finally, go through your checklist to make sure that all course components are accounted for and outlined for you and for your students. In the next section, we’ll construct a blueprint for your personal blended learning module or activity. First, let’s brainstorm some activities that might work well in a blended learning environment. Think about some of the goals you have for your course. What specific things do you feel require face-to-face interaction, or what activities do you think fit well in a traditional face-to-face classroom environment? What activities can you envision fitting well with an online environment? Are there any face-to-face activities or modules that you might be able to reconfigure or modify for an online environment? Add your ideas to the list on our Blended Learning activities Wiki page. Because the next chapter is dedicated to (1) building one or more activities or full modules that you can use in your course and (2) presenting some useful online rubrics and tutorials to guide you through this, as the final activity in this chapter we invite you to construct a “blueprint” that will help you start to sketch out these upcoming activities/modules. The idea with the blueprint is to synthesize the content from the previous chapters in this section in a manner that is most relevant to your particular course. Crafting a blueprint first will help you to provide a clear framework for your activity/module design, validate that you respond to the critical design elements for blended learning, and ensure that your stated learning objectives match up with your expectations, tasks, directions, and assessment that you create for your activity/module. We mentioned a few times that blended learning design is very scalable and easy to build on based on one activity or module that you initially craft and then later extend to other lessons, modules, weeks, and eventually whole the curriculum of your course. That’s exactly the goal of building an activity blueprint; it will give you a great start and a foot in the door with blended learning design! Take the concepts we’ve presented in prior chapters one step further and begin to apply them to your own course and instructional design process, using this template from Simmons College to map out a blended learning plan for at least one module or activity in your course.